While obvious for designers, font selection is often an afterthought for web developers. Many don’t realize that font selection, size, spacing, and color all have a profound effect on a web application’s overall usability. How much of an effect? It’s been said that typography is 95% of design. Your treatment of text elements can play a major role in the user’s opinion of your application. Now, am I saying you should become an expert in typography? Not at all. I’m simply saying that developers should be aware of its importance. Coming from a developer’s perspective, it’s easy to gloss over the importance of font selection without realizing its true impact on usability. If you’d like to read more on the topic, here’s a great article on typography basics for those unfamiliar with best practices. In my experience, many poorly designed web applications share a common problem: a lack of white space. The developer tries to cram a bunch of features and data into the application without considering that it might overwhelm the user. Proper use of padding and white space is often the difference between a clean or a cluttered interface. What do I mean by “white space?” White space is the area between elements on a page. 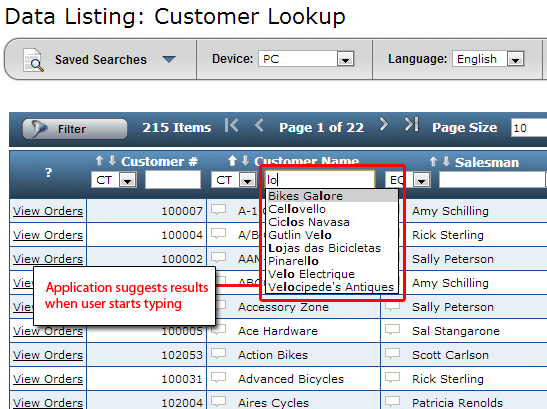 When applied correctly, it can turn a cluttered interface into a clean interface. For example, the image below shows the difference white space makes in a simple data table. Which one of these seems simpler and less overwhelming? The difference between a frustrated user and a happy user often comes down to communication. Does the web application provide the user with feedback? If a user clicks a button, does the application make it clear that it received the command? If an error occurs, how clearly does the application relay the error and steps to resolve it? These simple messages make all the difference in the world. You don’t realize the importance of context until you visit a web application that offers none. For instance, have you ever completed a multi-screen registration form without a progress meter? You feel lost–like you’re blindly stumbling through a dark cave, unsure of where you are or where you’re going. Are there 2 more steps or 10 more steps? Proper use of context gives the user three important pieces of information: Where they are, where they were, and where they are going. The image below gives a great example of context in a web app. A progress bar gives the user context as they navigate through a multi-screened web application. I’m always surprised by the sheer amount of inconsistent web applications I encounter. Consistency–a supposedly fundamental UI principal–is often ignored. Navigation elements, buttons, and color schemes frequently vary from screen to screen, creating frustrating and confusing interfaces. For web developers, this should be a simple fix. Keep your navigation elements in the same place. Don’t vary your color scheme from screen to screen. For instance, if an “action” button is green on one screen, don’t make it blue on another. Making the user’s life as simple as possible is one of the foundations of good web application usability. As Shea explains below, providing suggestions based on user input is a great way to make your application just a little bit easier. “If there is stored information that can be returned based on the first few keystrokes, let the user scroll down to select rather than typing in the entire field set,” he explains. Besides the slight time savings this offers to the user, it also offers another benefit: spelling error reduction. This alone will save users plenty of time and frustration. As an example, take a look at the image below. If the user was searching for “Lojas das Bicicletas,” don’t you see how much time the auto-suggest feature saves in this instance? Have you ever completed a form on a mobile device? Unless the developer accounted for the limited keyboards found on touch devices, you were forced to keep switching between the text and numeric keyboard options. While not a huge problem, it sure is inconvenient. How can an application automatically switch keyboards on the users device to account for varying input field types? HTML5 introduces some new form input types for that purpose, such as “tel” and “number.” We won’t get into each tag here, but this article provides a little more information on HTML5 input types. So, what do you think? Can you think of any other small UI elements that play a big role in usability? If so, I’d love to hear them in the comments.